I've been a little absent on Little Hiccups for the past week and a bit. There's been good reason though. My parents are in town visiting from Australia! It's been just over two years since their last visit. As you can imagine the girls are super excited to have Mamma and Papa here. And of course, Mamma and Papa are super excited to be spending time with us, especially little Mathilde. I'm so glad they were able to make it over to meet Mathilde while she's still so little. We started our first day out with my parents rather early with a Ride the Ducks adventure in San Francisco on the Saturday morning. I'll have an in depth post about Ride the Ducks coming soon but in the meantime here are a few of my favourite photos. 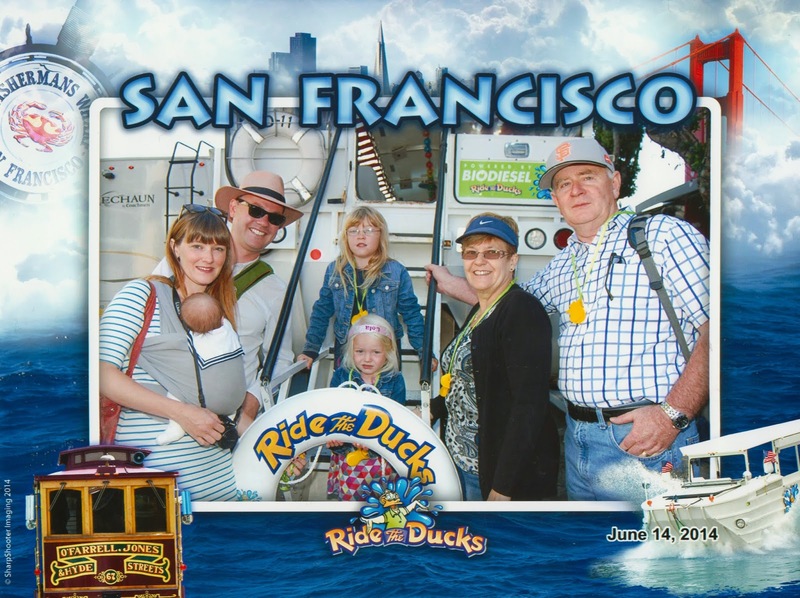 After our fun trip around San Francisco and the bay in the duck-mobile we headed to Fisherman's Wharf. We grabbed lunch at Boudin Bakery (clam chowder in a sourdough bread bowl of course!) and then watched through the bakery's windows as delicious sourdough creations were prepared. Oh the smell! Seriously, is there any smell better than that of baking bread? If we hadn't just stuffed ourselves with a huge lunch the smell of the sourdough baking would've certainly lured us in store. We never did end up making it onto Hyde Street Pier but instead went for a walk along Aquatic Park Pier. The views over San Francisco, the Bay and Alcatraz are beautiful. Plus there were plenty of seagulls and the odd sealion to keep the girls entertained. And raised concrete to balance on. Balancing makes everything more fun! We then left the waterfront and headed to nearby Ghirardelli Square for, what else, but a chocolatey treat at the Ghirardelli cafe. Four over-sized ice cream cones and a huge banana split later we were in need of a little exercise. What better exercise than hiking up San Francisco's steep, steep hills! We trudged up Hyde Street to the top of Lombard Street's wiggly section. The views looking back are amazing but it certainly is tough work! After a quick breather at the top we made our way down Lombard along with hundreds of other tourists keen to check out the "World's Crookedest Street" - which Lombard actually isn't. It isn't even the crookedest street in San Francisco. That honour goes to Vermont Street in Potrero Hill. There's your random fact for the day! It was a long and busy day, especially for the kids, but it was just the first of many more to come. We'll all certainly be needing a day or two of rest after my parents head back home! Stay tuned for more adventures out and about in San Francisco, Berkeley and Monterey as we play tourist with Mamma and Papa.